Excel's help is very useful. If you're developing an application that will be used by others, you may want to make it easy for the user to display a particular help topic from one of Excel's help files. You can use Application.Help or Application.Assistance.ShowHelp in Excel 2007 and up to display any help topic in any help file. But in order to use the Help method, you must know the context ID of the help topic. In Excel 2000-2003 the context ID's are numbers and it is not so easy to find the numbers. But you can find the numbers in the two workbooks that you can download on this bottom of this page. We can use Application.Help to display any help topic in Excel 2000-2003. The following VBA procedure displays that help topic in Excel 2000-2013. The code for Excel 2007 and up can also be replaced with this in the macro above to get the same result. In this case this is not needed but I show you how you can use it if needed. You see that you can use Application.Help also in 2007-2013 but the new help pages in 2007-2013 not only use a number anymore as context ID but a combination of a text and a number like : HP10073848. If you want to display for example the help for a worksheet function that is added in Excel 2013 you can not use Application.Help anymore but must use Application.Assistance.ShowHelp. This macro will show you the "Excel shortcut and function keys" help page in Excel 2007-2013. In Excel 2007 it is very easy to find the Topic ID. If you right click on a help page you can copy the ID to the clipboard with one click. For example you see this when you right click on the "Excel shortcut and function keys" help page. But in Excel 2010 and in Excel 2013 Microsoft makes it not easy. 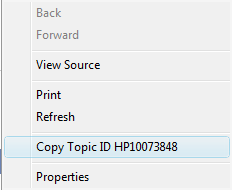 In Excel 2010 when you right click on the help page you see that the option to copy the Topic ID is removed but you can click on "View Source" and find your ID there. But in Excel 2013 there is no right click menu when you right click on a help page. 1) go to http://office.microsoft.com/en-us/ and enter for example Countifs in the seach box. 2) In Excel click the ? in the top right corner and enter for example Countifs, highlight the link, named : "COUNTIFS function" if you want the help for this function. Or highlight another link of the help page you want in the list that popup and copy/paste it in a worksheet cell. Then use Ctrl+K to display the Edit hyperlink Dialog box, you find the ID in the hyperlink address in this dialog box. the new functions in Excel 2007.